Dr. Kumar Mahabir presented a research paper on the marginalisation and exclusion of Bharatiyas by the Caribbean Examinations Council (CXC – www.cxc.org) in the CSEC and CAPE History and Literature syllabi. His presentation was made at the “Conference on Inclusive Education: Achieving Education for All” at the University of the West Indies (UWI), St. Augustine, Trinidad and Tobago, on February 15, 2017. The conference was organised by the School of Education of the UWI and Potsdam University in New York. Mahabir is an Assistant Professor in the Centre for Education Programmes at the Corinth campus of the University of Trinidad and Tobago (UTT). In his presentation, Mahabir argued that Bharatiyas in the Caribbean constitute about one and a half million persons in the English-speaking Caribbean. They constitute about half of the population in Trinidad and Tobago, Guyana and Suriname, and form the largest minority in Jamaica, St Lucia, St. Vincent and Grenada. Using content analysis and Paulo Freire’s theoretical framework, his presentation examined the extent Bharatiyas, and their indentured forebears, have been excluded in Caribbean Examinations Council (CXC) CSEC and CAPE History and Literature syllabi. Mahabir said that in its mandate to pursue socially-just educational practices, The United Nations (UNESCO), the World Forum in Dakar, and the World Conference on Education for All in Thailand, have recommended that minority ethnic groups should not be disadvantaged in receiving an education as well as in being excluded in the content of the curriculum. The discrimination against people of Bharatiya origin seems to be endemic in the Caribbean. 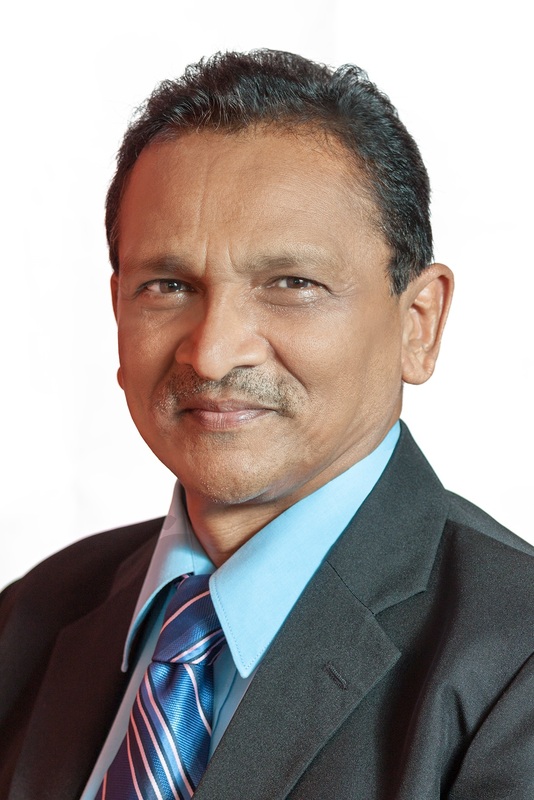 Last year, Dr. Mahabir had shown how the Trinidad & Tobago culture ministry was excluding Hindu cultural events. The Ministry of Community Development, Culture and the Arts of Trinidad and Tobago placed a full-page, full-colour advertisement in the daily newspapers (e.g. Guardian June 14, 2016. Page A43). A similar version of the notice was posted on the Ministry’s website. The advertisement was captioned “Our Calendar of Arts, Culture and Community Events” for June, 2016. 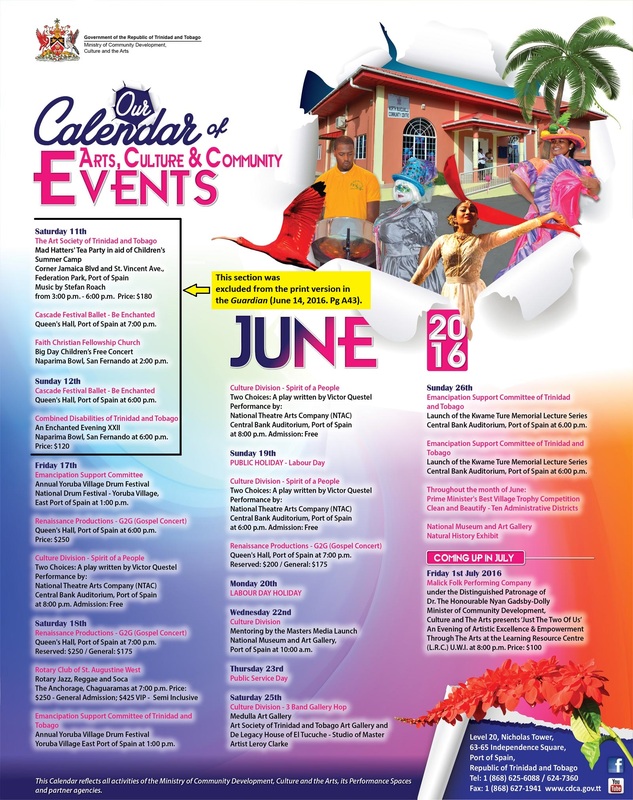 The dates included events organized by the Emancipation Support Committee (Annual Yoruba Village Drum Festival, Launch of the Kwame Ture Memorial Lecture Series), Renaissance Productions – G2G (Gospel Concerts), Culture Division (Two Choices: A play by Victor Questel, 3 Band Gallery Hop), The Art Society of Trinidad and Tobago (Mad Hatters Tea Party) and The Faith Christian Fellowship Church (Children’s Free Concert). The Ministry’s June cultural calendar included seventeen (17) events organised by seven (7) organisations. June 11: Kumar Sanu Concert at the Centre of Excellence. Organised by TANK Sound Co.
June 12: Devi Bhajan Mala [Garland of Hymns] at the Divali Nagar. Organised by Trinidad & Tobago Yatra Committee Inc.
June 19: Yoga on the Boardwalk in Chaguaramas in commemoration of the UN’s declaration of International Yoga Day. Organised mainly by the High Commission of India. June 26: Krishna Leela Dance Drama Procession in Caroni reverence to Surya Narayaan [The Supreme Sun]. Organised by Caroni Hindu Mandir. June 30: Launch of the documentary film, Calcutta to the Caribbean – An Indian Journey, at UWI. Organised by the High Commission of India & UWI’s Film Programme Department. The omission of eleven (11) major Indo-Trinidadian cultural events is a damning exposé of the narrow conscience/ness of the Ministry of Community Development, Culture and the Arts. The revelation opens a can of worms about the practices and policies of the Ministry. The failure to recognise these events is also an indication that the Ministry is not likely to provide funding to them. The disclosure in the calendar raises a number of critical questions. For example, is there ethnic equity in the top hierarchy of the Ministry’s staff? Not a single Bharatiya-oriented cultural event was included in the Ministry’s cultural calendar. This form of ethnic discrimination can be the discussion of an entire chapter in view of the fact that Indo-Trinidadians comprise the largest ethnic group in the cosmopolitan society (35%, 2011 CSO data). It is significant to note that the current Afro-dominated governing People’s National Movement (PNM) came into power in 1956, and was defeated in 1986 by the NAR party. It seems that the more things change, the more they remain the same, or even get worse. Is Thanthai Periyar Dravida Kazhagham (TPDK) guilty of crimes under SC & ST (Prevention of Atrocities) Act?